A spot-on emulation of the classic ARP Odyssey in its various incarnations, with some very well thought-out new features. Flawless emulation. Polyphonic. PPC pads have their own LFO. Sub oscillator for huge sounds. X-LFO and X-ADSR for X-tra modulation. Superb filter options. PPF LFO limited to sine wave. Can GForce's Oddity really be 12 years old? Released in 2002, this duophonic dynamo perfectly captured the character of the original ARP Oddysey upon which it was based. Even the most cynical of analogue evangelists were forced to concede this one, with stars of yesteryear - Herbie Hancock and John Foxx, to name but two - singing its praises. Brit developers GForce didn't miss a thing; this was, to all intents and purposes, the perfect counterfeit. And that must have posed a bit of a problem for the developer: how could something so on-the-nose be improved for v2? Some of the answers are obvious, addressing the unmet desires of those who owned the original hardware back in the day. First and foremost, we now have full polyphony - as gamechanging as the original Odyssey's duophonic capability must have seemed in the monophonic era, there's really no reason for any synth these days not to be able to play chords. "Oddity was almost perfect before, but this is an upgrade that simply can't be missed"
However, it's also spruced up Oddity's monophonic performance with new legato triggering modes. These are switched in using a fistful of buttons at the far left of a sizeable new section that straddles the top of the instrument's interface. Here, you can also determine the number of notes available for polyphonic playback (up to 32) and set the MIDI input channel. 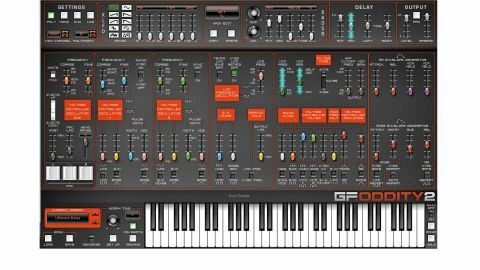 The majority of the new panel is taken up by the X-LFO and X-ADSR section, which will be familiar to users of GForce's Minimonsta Moog emulation. Each of these two modulation sources can be independently applied to almost all of the synth's parameters (simply click the target parameter and raise the amplitude of either X modulator), and any assigned parameter is indicated by a blue glow along its vertical throw - very cool, although separate colours for each modulator would be even better. Not to be confused with the main LFO that's always lived in the middle of Oddity's interface, the X-LFO offers a choice of ten waveforms (including red noise, brown noise and random), and sliders for adjusting the modulation depth, LFO Time, Delay, Sample and Hold, Smoothing and Sync. The X-ADSR is a five-stage envelope (Attack, Decay, Sustain, Sustain Time and Release) with knobs for adjusting modulation depth and velocity response. There are buttons for copying and pasting all X modulator settings between targets, and the fact that every parameter has its own X-LFO and X-ADSR gives Oddity2 a very powerful 'semimodular' angle. Interestingly, both can be run free or synced to host tempo, with time settings described in beat divisions when synced and milliseconds when not. Finally in the top section, there's a (modulatable!) delay effect and an Output section with a Pan switch and Spread slider. The former switches between two pan modes: Normal, in which left/right panning is relative to the keyboard (with notes heading further right, the higher in pitch they get) and Random. The Spread slider sets the stereo width in Normal mode and the amount of randomisation in Random mode. The PPC pads replace the pitchbend knob of Oddity, just as they did between revisions of the original hardware. The left and right Proportional Pitch Control pads on the Odyssey were used to bend the pitch, while the middle one applied modulation from the LFO. Here, the assignments are the same, but the middle pad controls the depth of a dedicated pitch LFO, the rate of which is set using the slider above. This LFO is limited to a sine wave shape, but there's nothing stopping you assigning your mod wheel to an X-LFO instead if you need more. "Around 1400 presets are included, covering all conceivable bases"
Above the PPC, the Transpose switch shifts the whole synth up or down by two octaves - it looks like the old Bend Range switch, but that's now a slider. The A440 switch has been moved to the right of the keyboard to make room for a new Sub Oscillator (square or saw waves; no FM or PWM) that can be used to beef up the sound, enabling - along with the new filter options - beefy Minimoog-style patches to be constructed. Further additions and improvements include adjustment of morph times in beat divisions as well as milliseconds, response to Program Change messages for the currently loaded bank, and pitch Bend Range now being saved with the patch. On the subject of patches, around 1400 presets are included, covering all conceivable bases. Not insignificantly, there's now also an FX version of the plugin, allowing you to route audio signals through Oddity's filters, delay and ring modulation. For more on those filters, see ARP a la modes. Finally, it may not be a particularly big thing, but the interface is now dark orange and black, reflecting ARP's third-generation colour scheme. GForce has surpassed our expectations with the second coming of its flagship synth. Oddity was almost perfect before, but this is an upgrade that simply can't be missed. If Oddity sounded like a real Odyssey (which it did), then Oddity2 sounds almost like an entire revision history of the instrument, thanks to its greatly expanded filters, supercharged by the X-LFO and X-ADSR, which give it the ability it to produce sounds of far greater complexity than could ever be had from the original. Essential.